Quiet is difficult to find most days. We can schedule it, we crave it, and must be purposeful in our quest for peace and order. Even my dog is a heavy breather, so when she sleeps sideways in her bed, I can still hear her in the next room. This poem makes a good case for silence. What seems absurd at first read—limiting our speech to 167 words per day—is actually a compelling idea. What would we say if we had less than 200 words to say it in? It would force us to think before we speak, become calculated, thoughtful, and only focus on that which is the most important. By the end of the poem, we find two lovers that have used all their words, and can do nothing but listen to each other breathe. This poem reminds us of what can still be said in the silences, and how just existing next to one another, we communicate in a deeply intimate way without uttering a single word. from The Forgiveness Parade (Manic D Press). Reprinted with permission from the publisher. When I arrived at the line about chicken noodle soup, it made me think of how the world feels when we have symptoms of a cold coming on. All you want is comforting, healing soup, and a warm bed to sleep in. 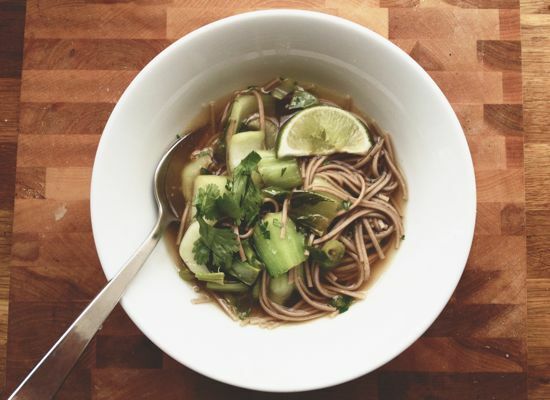 Colds often force us into quiet and solitude whether we like it or not, or into the kitchen to make ginger noodle broth. If you find yourself feeling down or under the weather this holiday season, pull out your stock pot. Not always (especially when friends are over), but there are many moments when cooking can be supremely quiet. Like when you're alone at the stove, stirring, hoping that the consistent inhaling of ginger broth will clear your nasal passages. There is a thud when the wooden spoon hits the side of the stock pot, the crisp sound of your knife making its way along the cutting board, certainly. But those sounds don't interfere with thinking or being, they just surround you, the way soup coats the lining of your stomach with a deep heat the first moment a spoonful is swallowed. 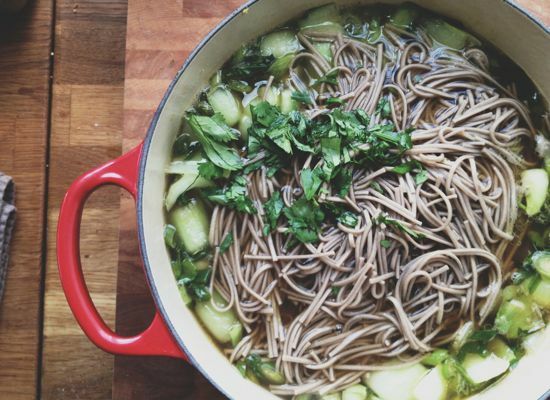 When it comes to cooking the soba noodles, you have two choices. If you're serving the soup right away with no anticipated leftovers, simply add the noodles to the ginger broth and cook until tender. If the soup isn't served immediately, the noodles will continue absorbing the beautiful broth, and while it will taste just fine, your noodles will be a bit soggy and the broth will disappear like bath water down the drain. Although it uses another pot, I prefer to cook the noodles separately, then rinse in cold water to ensure the cooking has stopped. Heat 1 tablespoon safflower oil in a 3.5 quart Dutch oven or stock pot over low heat. Grate the ginger and garlic into the pan. Add the scallions and season with salt and pepper. 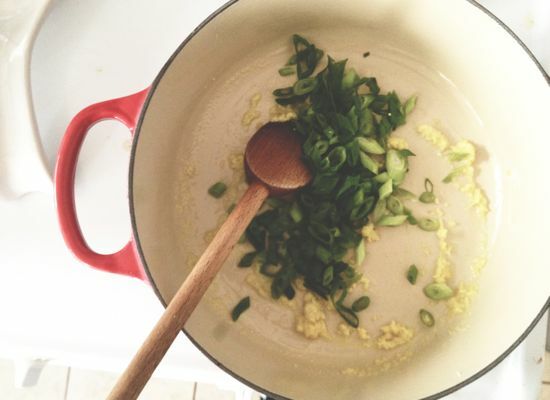 Cook for 3-5 minutes, until fragrant and the scallions have wilted. Add vegetable stock and bring to a boil, then let simmer while you prepare the bok choy. Cut off the bottoms, and chop the bok choy leaves into large pieces. Add to a sauté pan with a little oil heated over medium heat. Season with salt and pepper, and stir to combine. 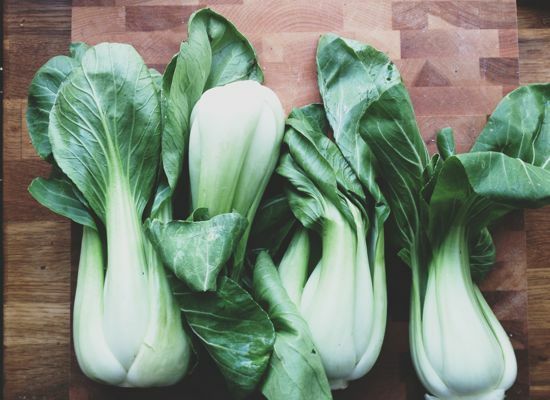 The bok choy will cook quickly, so turn off the heat once the leaves are just wilted and have browned in places. Add to the broth. Bring a large pot of water to a boil, salt the water, then break the soba noodles into thirds before dropping them in. Cook according to package directions (about 4-5 minutes) until tender; drain under cold water. To serve, add noodles separately to each bowl, then ladle broth over the top. Garnish with cilantro and a squeeze of lime.